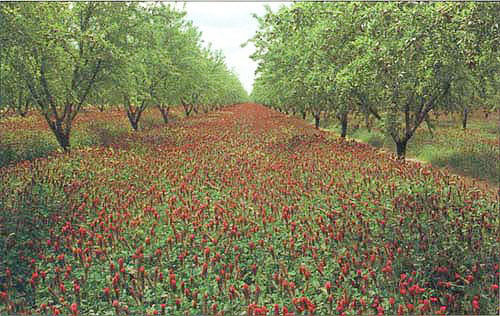 Crimson clover carpets an orchard of almond trees. "I have a question for anyone who has a small (or large) orchard. How do you keep down the grass?" Geese; they work wonders, they drive off snakes too. I call them Christmas and dinner. Lots of mulch and a lawn mower!!!! I don't at the moment but the owner of my place told me the chickens would do it in the past. It would be nice if I was in an area where I could grow peanuts or sweet potato under the trees but no. I don't think ..I do mulch around my trees with old chook bedding though. We ended up with grass on our entire 24 acre orchard in the 1960s & shared a tractor drawn 3 disc mower, with an extendable disc with a bicycle wheel & tire cover to protect the tree trunks & we ended up with so much better surface soil than when it had all been ploughed! The trees were able to send out near surface feeder roots many feet from the trees, which would previously been cut off! Chooks do a pretty good job and clean up the bugs.. I have no authority on this at all, but, for a small area im sure ive read that guinea pigs can keep the grass down. But obviously only for a small area etc. Depends how many you have!! We are sheet mulching (small orchard) layers of cardboard and chipped tree bark. Kris recommends wetting the cardboard and putting down a layer of manure underneath first. We ended up with a fair amount of clover in our orchard! Dad sowed clover & rye grass in the first sections he converted, but after that it spread & latter areas he just leveled it out & mowed whatever came up & it's amazing how quickly it became permanent mixed pasture with various grasses, docks, plantain, dandelions & whatever, but they all grow, build up the soil & mulch when mowed! Towards the end, we left in 1971, Dad was using Diquat & Paraquat to kill the growth along the tree line, but aside from the chemicals, I believe it was a mistake, because then we got annual weeds & grasses, like Barnyard Grass, there instead! Like when the council sprays the side of the road to kill the grass & Capeweed etc comes up instead! I'm not opposed to a bit of round-up to get rid of grass and perennial weeds, but I then try and mulch, preferably with newspaper as an underlay. I'm a fan of wood chips / bark, because the chooks mostly leave it alone. I always put some manure out under woodchips, but I think the impact of nitrogen draw down is massively overstated, so long as it is aged a bit. A common problem for fruit trees is too much nitrogen, so I tend to think tying it up temporarily in the wood chips (it gets released over time again anyway) is a good thing. After a couple of applications of wood mulch you will have loads of worms and a much improved soil :) Around my fruit trees I grow a few low, ground cover herbs like achillea, catmint, thyme, hyssop, etc, though this is still a bit patchy :) The idea is that each row will eventually be more like a cottage garden than an orchard... That might impact productivity a little, but I have a couple of hundred trees and there are 2 of us. In between fruit tree rows I just mow. In the veg garden where the chooks can't go, I try and use Lucerne when I can get it. I've worded up the local stockfeed, so they let me know when there is rain damaged stuff around I can get cheap. I also encourage a good mix of perennial herbs/ choice edible weeds to naturalise in the orchard for ready supply of potherbs and greens for family and livestock. More diversity for resilience and nutrient cycling. But also keep focus on the process and the evolution of the system rather than an unrealistic static end point. It's never the same year to year, it's all ok as long as the soil keeps improving. I keep my chooks under fruit trees. Geese mow grass well. We run geese in our orchard and sheep when the trees are dormant. Spring grass growth out paces anything they can eat though, esp when the geese have goslings to worry about in spring. I'll make the suggestion that grasses are bad companions for fruit trees but with the exception of kikuyu not excessively bad. Broad leaf plants not in the solanaceae (tomato) family good companions and much less fire promoting than many grass's. Nancy Morgan spoke at our grafting day and said strawberries were very bad for fruit trees, what are the observations? How are the different critters (ducks, geese, chooks, guinea pigs) influencing the broad leaf to grass ratio? Oh bugger Neil I'd not heard that about strawbs! I just moved a whole heap to under the fruit trees - I was going with the guild premise of runners/clumpers/miners, etc. Why are strawberries bad? I hadn't thought of using oca, since it's a little weedy, but that isn't a problem in the orchard I suppose. They are tasty, like a lemony potato, and you can eat the leaves too. But they won't fix nitrogen like peanuts... licorice is a good low growing nitrogen fixer, that is pretty and useful. I have a few apios americana (potato bean) but I haven't trialled it in the orchard yet. Oh man, I'm making a big list here. Bergamot I could many my own Earl Grey! Sorry to say there are 2 different bergamots, Alexandra Westlund The pretty, flowering, bee attracting low-growing plant is not the plant used to make Earl Grey tea, though maybe you could make Countess Alexandra tea with it... The bergamot used in the tea is a citrus fruit. Citrus bergamia = the bergamot orange (we have one growing) and Monarda didyma = bergamot herb. I have self seeded parsnip, carrots, parsley, chicory, sculpit (Silene vulgaris) , salsify, sand rocket fennel. Then I've planted dwarf comfrey (S.grandiflorum) tansy, yarrow, wooly yarrow, Teucrium scorodonia, wallflowers, strawberries (Fragaria moscata and F.vesca), liquorice running everywhere. Vetiver grass as low windbreak/ hedge and some sort of ryegrass , Eragrostis tef, and various millets. Plenty others too numerous to mention. 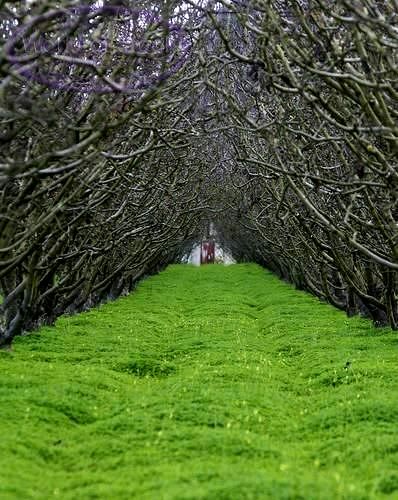 Clover provides a thick ground-cover in an apple orchard.